A video has been making the rounds that purports to show an incredible Eucharistic miracle: a host levitating during the consecration on live TV in France! But is it real? Here’s what you need to know. 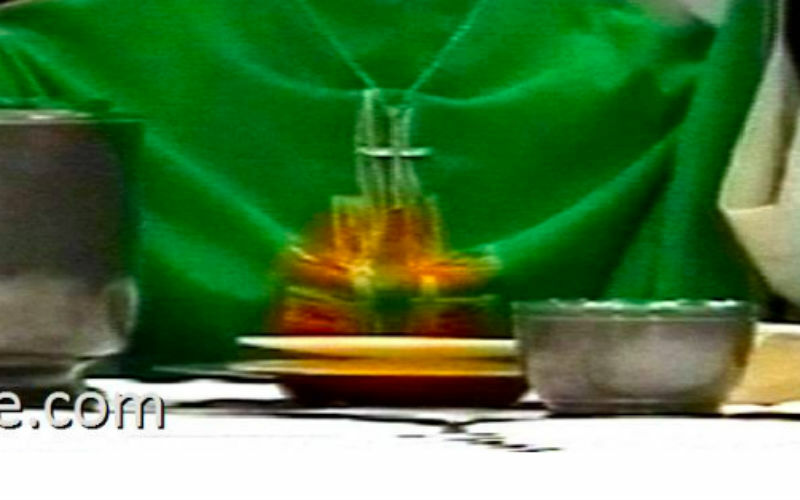 If you look carefully, at around 0:39 the Eucharistic host appears to suddenly jump up off the paten about an inch and start levitating. You can see it supposedly levitating for about 20 seconds, when the camera cuts away and the priest lifts the host. Later in the video after the priest has put the host down, it appears to be levitating again from 3:06 to the end. The video’s description claims that the video is a clip from a TV broadcast in France on November 7th, 1999 of a solemn Mass held in the minor Basilica of Lourdes with Cardinal Louis-Marie Billé, Cardinal Jean-Marie Lustiger, and a number of other priests. Posted around the Internet, it has garnered millions of views. So is it for real? We have not been able to definitely make a determination one way or the other, but several things count strongly for it being fake. First, the earliest we can find information about it is from 2005. If there really was a miracle on live TV in France in 1999, wouldn’t it have been big news? Second, nobody present on the altar appears to react to it. Wouldn’t one of them have noticed it and reacted in some way? Third, the video is pretty low quality, which means it’d be easy for it to be edited inconspicuously. Fourth, isn’t it a strange miracle? Why would the host only sort of levitate about an inch? And even after he set it down? But maybe we’re missing something.